Ganabharathi of Mysuru revived a good old tradition of celebrating Haridasa Utsava instead of Tyagaraja Aradhana which goes on throughout the month from many music sabhas at Mysuru. 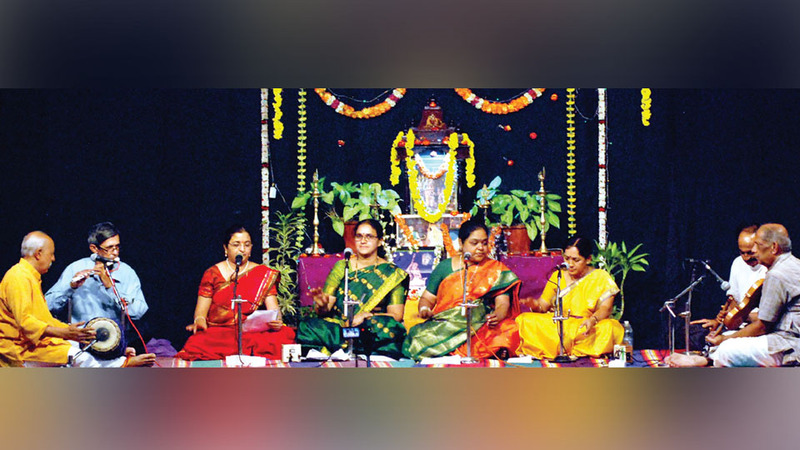 Retaining its ‘Taruna Bharathi,’ a platform for young musicians, it added two more days of Haridasa Utsava which spread from Feb. 2 to 5 at its Veene Seshanna Bhavana. The importance of this festival came alive in bringing out many unheard Devaranamas of many Haridasas. The same old ‘Krishna Nee Begane’ or ‘Jagadoddharana’ were replaced by ‘Daasarigunte Bhayashoka?’ or ‘Vyarthavallave Januma?’ or ‘Lambodhara Rakthambara’ and many more. The rich contribution of many Haridasas, which had taken a backseat, did come to light through this unique festival. Dasa Sahitya has contributed immensely to Kannada literature apart from preaching the fundamental truth and eternal values to common man. The rich tradition of rendering these padas has diminished over the period. The moral and lyrical beauty in them certainly deserve a better place on the music platforms. The concerts have restricted them for a few songs of either Purandaradasa or Kanakadasa. There are several Haridasas like Jagannathadasa, Vijayadasa, Mahipathidasa and many more. The Haridasas laid stress upon the devotional aspect of religion through dialect and music. Their Bhakti Movement was indeed a reform in many ways. Many Haridasas went from door to door preaching God through psalms which had the message of liberation or Mukti too. It modified the existing institutions in the direction of salvation which was their ultimate goal. Though Narahari Theertha was believed to be its pioneer, scholars say that it was Sripadaraja who actually laid a firm foundation for Dasa Sahitya. His disciple Vyasaraja played a major role in preparing a band of Haridasas like Purandara and others. Kanakadasa, a major contributor, though not his shishya, held him in high esteem. Vijayadasa, Gopaladasa,Jagannathadasa, Kakhandaki Mahipathidasa, Prasanna Venkatadasa, Mohanadasa, Praneshadasa, Harapanahalli Bheemavva and many more continued the legacy. These nuggets need to be unearthed. This festival gave an opportunity to listen to nearly 135 unheard songs penned by different Haridasas. Twentyseven artistes, senior and young, presented them with devotion. Apart from Vid. T.P. Vaidyanathan, Dr. R.N. Srilatha, Dr. Sukanya Prabhakar, Koviladi Kala, Bellary M. Raghavendra and youngsters like Manasa Nayana, N. Srinath, K.T. Udayakiran, Ashok-Hariharan, Sharath Rao, M.A.Jyothi, there were Hindustani singers too like Dr. Bhaskar, Kalpana Sumanth and Nithin Rajaram Shastry. Nearly 35 accompanists joined their hands. The Goshti Gana on Feb. 5 consisted of the Navarathna Malike of Purandaradasa. As part of ‘Taruna Bharathi,’ (on Feb. 2), young Surabhi Pustakam, accompanied by Keshava (violin), T. Nikshit (mridanga)and T.N. Ajay (ghata) and Aneesh Bhat, accompanied by Sumanth Manjunath (violin), M.L.Vadiraj (mridanga)and Ajay (ghata) enthralled the audience with their vibrant presentation. Harini Ramesh along with Shruthi (violin), Malolasimha (mridanga) and Vikram (ghata) followed by a mandoline recital by Rakshith Prasad, Aniruddha Bharadwaj (violin), Vishnuvardhan (mridanga) and Vikram (ghata) captured the listeners on Feb. 3. These youngsters presented more of Tyagaraja’s compositions. Such celebrations become more meaningful when it brings out the unheard compositions to practice.